The narrative of Shadow of a Doubt was based on a story called “Uncle Charlie” by Gordon McConell. For the adaptation, Hitchcock turned to Thornton Wilder, confident the author of Our Town possessed the vision of small-town American he wanted to incorporate into Shadow of a Doubt. Wilder, who helped Hitchcock select Santa Rosa, California, as the setting, wrote a prose outline for the story before he was mobilized into World War II. Hitchcock then turned to Sally Benson, another writer deeply steeped in Americana. 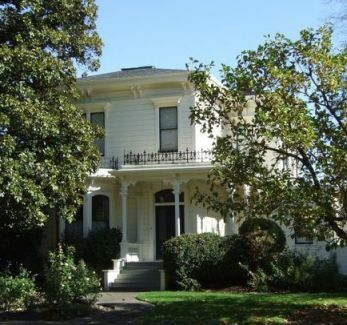 Her “5135 Kensington Avenue” stories became the basis for Meet Me in St. Louis. The opening scenes of Shadow of a Doubt establish that the man we will soon come to know as Charles Oakley (Joseph Cotten) has troubling secrets and, by the time he descends on tranquil Santa Rosa and his sister’s family (the Newtons), we know something sinister is at hand. But Oakley is smooth; his voice is velvet and his manner insinuating. He has seen the world and dazzles with his money and his style. When he settles in with the Newton family, their staid community is charmed and responds with an open embrace. Wright and Cotten play against each other in perfect counterpoint; she was never more fetchingly wholesome, he never more darkly complex. Supporting the two is a distinguished cast: Hume Cronyn in his memorable film debut as the Newton’s eccentric next-door-neighbor, Herbie; cozy and congenial Henry Travers as small-town-dad Joe Newton; underrated Patricia Collinge as fluttery and sentimental Emma Newton. Adding nuance and color are Edna May Wonacott as cheeky little sister Ann Newton and Wallace Ford as one of two detectives on Oakley’s trail. Macdonald Carey, as the other detective, is Wright’s love interest. Shadow of a Doubt has been called Hitchcock’s first fully realized masterpiece. 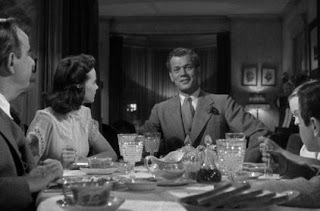 I can’t ignore his direction and overall imprint on Rebecca or his early triumph with Blackmail, but agree that Shadow of a Doubt, multi-layered and meticulously constructed, is among his very best films. As much as I love Hitch's big epic movies, particularly Vertigo, to me Shadow is his masterpiece of deceptively simple filmmaking, which I never forgot after I first saw it. You have said it all -- Wright and Cotten aqree perfect together; the setting of the best-of-American town, everything makes Uncle Charlie all the more upsetting and horrifying. By the way, loved your caption for the all-American house -- you did mean to do a play on the title of that completely-different-America movie, didn't you? LOL! I like your descriptions of the characters. One of my favorite films. Hitchcock was smart to lean on Benson and Wilder to bring the small-town America sense he wanted. Patricia Collinge, who played the mother and was also a writer, helped out by re-writing a scene or two as well. Alfred Hitchcock has always appealed to me as being totally in control, and completely dedicated to bring HIS complete vision to the screen. He also always brought his films in on time and under budget. 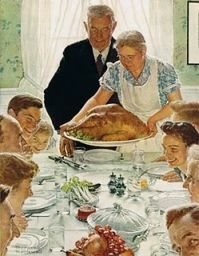 Your comparison to Norman Rockwell is interesting. Hitch and Rock (if I may be familiar) both knew how to achieve perfection in their own work. I wonder if Hitch had Rock in mind when he told the cinematographer where to point the camera. For another Rockwellesque (is that a word?) Hitch film, make sure to check out The Trouble With Harry (1955). Great fun and beautiful New England scenery worthy of Norman Rockwell. Jacqueline - I'd read that Patricia Collinge contributed to the script - what a talent she was, and she made far too few movies. Allen - I don't know if Hitchcock had Rockwell in mind when he imagined SOAD's small-town and the people in it. Rockwell's work is synonymous with Americana - often with a touch of humor - and so SOAD seems to me 'Rockwellian' - up to the point that Uncle Charlie's true nature is fully disclosed. Oh so true, Lady Eve. Uncle Charlie was indeed like William Blake's worm in the beautiful but sick rose. I always think of that poem when I see "Shadow of a Doubt." However, I would like to see a sequel where young Charlie grows up to be a psychic. I wish that angle had been explored a little more. I love Shadow of a Doubt like Hume Cronyn and Henry Travers love talking about murders. It's one of my all-time favorite Hitchcocks, so your post was very welcome to my heart. And you're so right about the contrast and chemistry of Wright and Cotten. I keep wanting to get a hold of The Steel Trap, where they play a married couple, but so far no luck. Charlie was always my favorite Hitchcock heroine. She's naive but smart, with the hint of a dark side. And she's brunette! Joseph Cotton was like velvet on the surface but underneath was pure acid. Probably my favorite performance of his. Excellent stuff, Eve! FlickChick - Excellent point about the Blake poem, I hadn't thought of it at all, but it's perfect - here's a link for those who don't know the poem or would like a reminder: http://www.online-literature.com/blake/623/ - Uncle Charlie was the worm in the Oakley/Newton family (for starters). Rachel - I like the scenes between Travers and Cronyn, too, particularly the moment when Cronyn tells Travers of his idea to kill him with a pipe and make it look like a suicide (though he admits it doesn't seem likely a man would beat himself to death). I haven't seen and am not familiar with "Steel Trap," but it sounds interesting, Wright and Cotten as a couple. John - I think this is my favorite performance of Cotten's, too. He was cast against type for the role and is terrifyingly believable - among other things, using his gorgeous voice to emphasize his dangerousness. This is one of my favorite Hitchcock's as well, with so many memorable scenes in it. I've always been impressed with the shots of the train bringing Uncle Charlie to town, as it belches enormous plumes of dense black smoke, so thick it looks like the smoke is going to envelop the entire town. I always think of it as a death train arriving in quiet little Santa Rosa. Kevin - I think you're right about Uncle Charlie's arrival in Santa Rosa on a train spewing black clouds of smoke - an indicator of the evil aboard as well as what will transpire while he's in town. Interesting that he is killed by a train in the end. I love this film and some of my favorite scenes, is the ongoing discussion between Henry Travers and Hume Cronyn, mystery readers( who look like a couple of Norman Rockwell characters), who are constantly discussing the best ways to murder each other. Dawn, I'm glad you mentioned 'Norman Rockwell characters'...I didn't mention Rockwell anywhere but in the title of the post, but are several in the film - first and foremost Travers and Cronyn...and also the traffic cop and librarian - and Edna May Wonacott played a very 'Rockwellian' little girl. Probably everyone but Joseph Cotten could have been featured in a Rockwell painting. 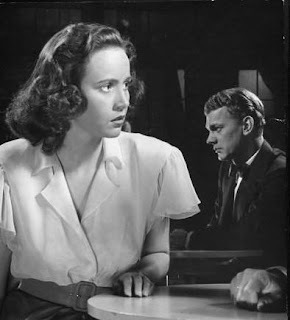 Can I just say that I love Teresa Wright? Her body of work is spectacular. She and Cotten are perfectly cast. Excellent article. Jill - She was a wonderful actress - Oscar-nominated for her first three films (and won one) - she deserved a a nomination for "Shadow of a Doubt" too. Eve, I don't think I mentioned, but after talking about doing different things with blogs, I like your look. 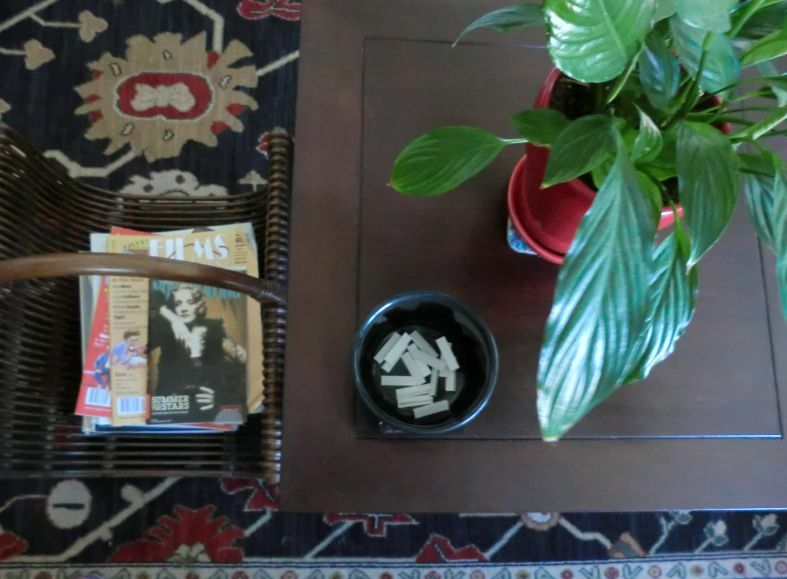 It's funny about how different everybody is with what's easy to read, appealing to the eye. I'm lucky -- I don't have a problem with reading most any type of color on whatever background (except red on blue or blue or red - I just can't see text that way, don't know why). One of the big advantages of lighter background like yours, to me, is that the black and white movie pictures stand out more! No matter what you pick, there is always a hook, isn't there?